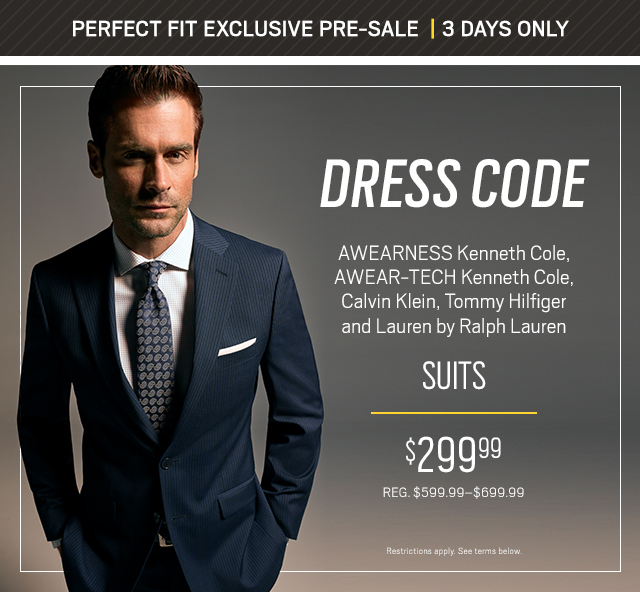 Perfect Fit Exclusive Pre-sale I Hurry in for the best selection. To redeem: Print this coupon OR present on mobile device. Select styles only. Coupon must be presented to receive pre-sale discount. Cannot be combined with other promotions. All offers exclude clearance, Exceptional Value & custom items. We have 100+ locations nationwide. Come on in and find your style. All offers are subject to availability. Selection varies by store. These offers are valid for new purchases only. Discounts may not be applied to Exceptional Value or custom items, alterations, tuxedo rentals or the fees and taxes associated thereto, or toward the purchase of gift cards. Offers are not combinable. Customers returning items purchased will forfeit the portion of the discount used for those items. The Moores return policy will apply to the remainder of the purchase. Perfect Fit points are earned only on amounts expended by you in connection with the purchase and are deducted for any returns. PERFECT FIT EXCLUSIVE PRE-SALE: Select styles only. Coupon must be presented to receive pre-sale discount. Cannot be combined with other promotions. All offers exclude clearance, Exceptional Value & custom items. 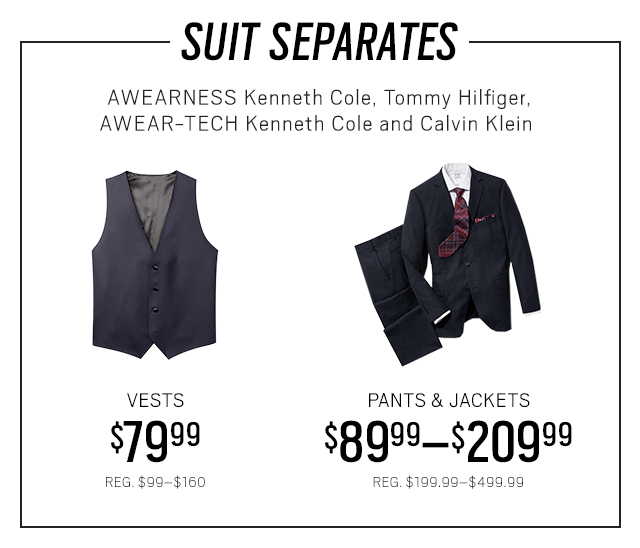 $299.99 DESIGNER SUITS/SUIT SEPARATES: Select styles only. Additional charge for Big & Tall sizes & matching vest. All offers exclude clearance, Exceptional Value & custom items. 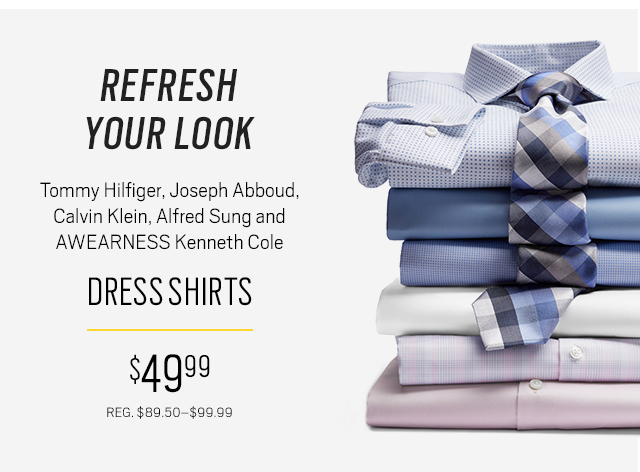 $49.99 DESIGNER DRESS SHIRTS: Select styles only. Additional charge for Big & Tall sizes & French cuff. Excludes clearance and Exceptional Value items. BUY 1 GET 1 FREE: Excludes sale, clearance, Exceptional Value & custom items, jeans, accessories & shoes. Buy one item at its regular retail price and get a second like item of equal or lesser value for free. If the purchased item is returned, you must either return the free item or purchase the free item at current retail price. Please add mooresclothing@email.mooresclothing.com to your address book. Did a friend forward you this message? Be the first to know about sales and discounts. Sign up for our emails.